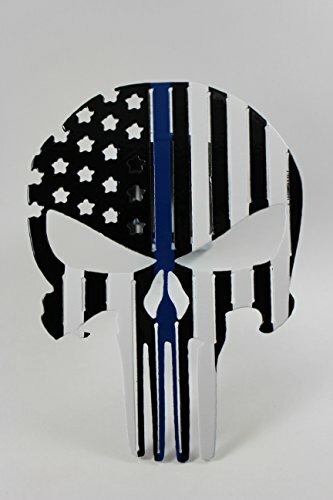 Punisher Flag Trailer Hitch Cover With Blue Line by Turpins Horseshoe Creations at HoldUp Art. Hurry! Limited time offer. Offer valid only while supplies last. Punisher hitch cover painted with black stars, black and white stripes, and a single blue line stripe. Back the blue with this awesome hitch cover. Punisher hitch cover painted with black stars, black and white stripes, and a single blue line stripe. Back the blue with this awesome hitch cover. You can show your support for the men and woman that wear the uniform every day! These hitch covers are 6 inches wide by 8 inches tall, and come with the hole drilled to secure to your vehicle. Please ask us about any customization's! Please pick if you would like a sparkle black (metallic black) or just plain black. All pieces come fully powder coated now! Due to the harsh environments that these hitch covers exist in, rust proofing can not be guaranteed.